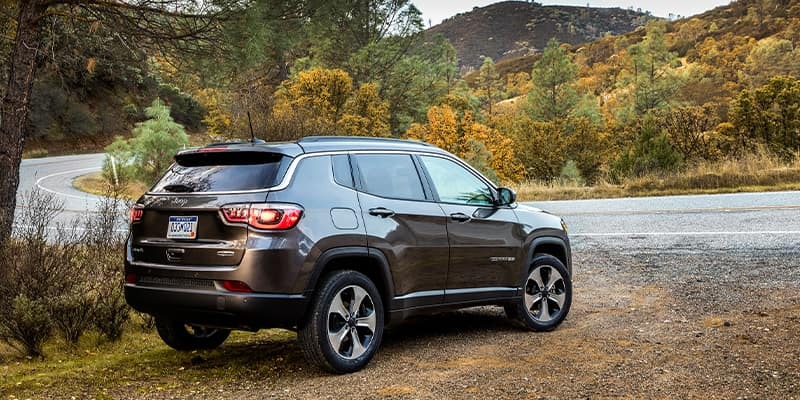 The Compass, one of the Jeep brand’s entry-level SUVs, is very similar to the brand’s other compact SUV – the Cherokee, with the only difference being that the Compass features a slightly smaller outside build. In its second generation, the Compass offers a few updates for the 2019 model year in terms of appearance and additional performance packages. There are new paint colors, an improved infotainment system for base models, and new safety options. These are the 2019 Jeep Compass highlights. The 2019 Jeep Compass is offered in four different trims: Sport, Latitude, Trailhawk and Limited. Standard under the hood of every 2019 Jeep Compass is a 2.4-liter four-cylinder engine capable of generating 180 horsepower and 175 lb-ft of torque. High-tier trims also feature engine stop-start technology as well. The Sport and 4×4 Latitude trims come standard with a six-speed manual transmission, while the Latitude and Limited 4×2 trims are mated to a six-speed automatic transmission. An impressive nine-speed automatic transmission is standard on the Trailhawk and Limited trims. Standard safety features offered on the 2019 Jeep Compass include multistage airbags, stability control, hill-start assist, parking sensors, a rearview camera, and an anti-theft system. There’s an Advanced Safety Group package available that includes brake assist, rain-sensing windshield wipers, lane-departure alerts, forward-collision warnings, and even adaptive cruise control. A 7-inch infotainment touchscreen display comes standard on the Compass, complete with a six-speaker audio system, USB ports, Apple CarPlay, and Google Android Auto capabilities, Bluetooth connectivity, voice commands, 12-volt power outlets and an innovative off-road performance information screen on trims with 4×4 systems. Upgrades to the infotainment system include two different versions of an 8.4-inch touchscreen display with navigation, SiriusXM Satellite radio and an additional two USB ports. Cloth upholstery comes standard on the 2019 Compass with folding rear seats, dual-zone automatic climate controls, manually adjustable seats, and cargo tie-downs. Leather and vinyl upholstery upgrades are available, as well as heated front seats, power-adjustable seats, an all-weather protection package, memory seats and mirrors, a heated steering wheel, and a power sunroof. The six-speed manual transmission and 4×2 drive give the Compass an EPA-estimated fuel economy rating of 23 mpg in the city and 32 mpg on the highway, while the same transmission equipped with a 4×4 system yields 22 mpg in the city and 31 mpg on the highway. When equipped with the nine-speed transmission, the Compass has an EPA-estimated fuel economy rating of 22 mpg in the city and 30 mpg on the highway. Explore the 2019 Jeep Compass inventory at Hollywood Chrysler Jeep. Schedule your test drive today and let The Jeep Experts answer any questions you may have. Follow Hollywood Chrysler Jeep on social media and stay up to date with the latest Jeep news.